All your life you’ve probably heard that a good stretch before working out helps you reduce the risk of an injury. Warming up prepares your body for the demands of physical activity. It sends more oxygen and blood flow to your muscles and mentally prepares you for what’s to come, in terms of concentration, motivation and coordination. These benefits are true, but stretching before your exercise session may not be all that good for you. Sometimes they may even weaken your muscles. Static stretching involves stretching a muscle to the point of mild discomfort and holding that position for about 30 seconds. Static stretching is the most common form of stretching in general fitness and is considered safe and effective for improving flexibility. However, experts consider static stretching less helpful than dynamic stretching (which involves gentle repetitive movements) for improving your range of motion for functional movement, and everyday sports and activities. You need a great deal of flexibility with sports. With hockey, soccer and rugby, extreme flexibility is not necessary, but for swimming and tennis and the like, you’ll need to be relatively limber. Every sport has a certain set of skills that requires a certain type of flexibility. You should always stretch, but the best time to do so is at end of your workout, right after you cool down. Your muscles and joints are now warmer and more lubricated after the session than they were before you started. Your body returns to its relaxed state after a workout so stretching after exercise is also a feel-good way to end your workout. Dynamic stretching is thought to be more effective for your warm-up as it wakes up your central nervous system, increases your core temperature, and gets your blood pumping. These repetitive movements include leg swings, gentle squats, and bridges. During dynamic stretching, you gradually increase the range of motion of the movement, but always remain within the overall normal range of motion. 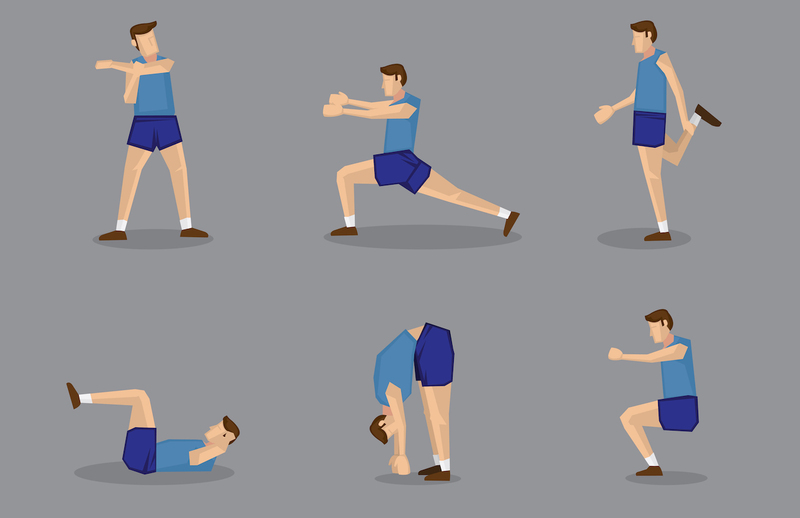 Basically, you should aim to stretch regularly, but stretching after your workout will do more for your health and reduce your chances of being injured. Don’t skip cool down, do these stretches after your workout. Take one arm overhead, bend at your elbow joint, and extend the palm down the centre of your back, gently pulling your elbow with your opposite hand. Take the same arm across the chest, gently pulling at the elbow joint, to extend through the shoulder. Switch arms and repeat. Lying on your right side, pull your left heel into your left glute; you will feel the stretch in the front of the thigh. Repeat with the right leg. Lying on your back, lift and straighten one leg directly above your hips. Holding the calf or thigh, press your heel towards the ceiling as you pull your leg back toward your chest. Switch legs. Lying on your back, cross your right leg over your bent left knee. Then bring the left knee to the chest, while holding onto the back of your thigh. Gently press your right knee wide. Switch legs. Standing straight, interlace your fingers behind your back as you straighten out your arms and lift your chin to the ceiling. Get on all fours, round out your back and then turn it upside down, making a C-shape with your spine, Repeat three times. Then, sit back between your heels, forehead on the mat, arms extended in the front.